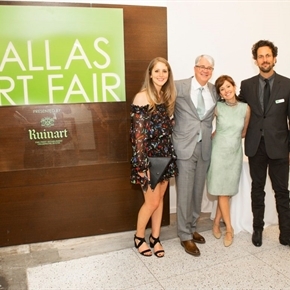 A mélange of art types, social butterflies, and trendsetters flocked to the Fashion Industry Gallery not only for a sneak peak of the amazing works on parade at the Dallas Art Fair Preview Gala but also for high-level schmoozing. Check out the artful side of the festivities here while we fill you in on the social scene. The not-to-be-missed affair kicked off the weekend’s festivities and was, as is tradition, as much an art world gathering as a see-and-be-seen opportunity, read that one of the hottest social tickets of the season. Presiding over the colorful event was the Dallas Art Fair dream team: founders John Sughrue and Chris Byrne; Brandon Kennedy, Kelly Cornell, and Marlene Sughrue, all holding court in the main lobby where they greeted guests. Like certain veteran preview party fans, we quickly made our way to the Ruinart champagne bar where we hopped in line with Kaleta Blaffer Johnson and other high-profile Dallasites. Savvy art fans know that this is the place to be at the start of the evening. After all, it’s champagne and it offers a front row ticket for the richest of people-watching. And watch we did: Gable and Ed Shaikh posing for a photo with the paps; Lynn and Allan McBee chatting with Nasher Sculpture Center director Jeremy Strick; New Orleans-based artist Ashley Longshore discussing her fabulously fierce outfit (check out her photo in the slide show) with Faisal Halum, and more. So much more. We popped by to chat with Dallas-based Erin Cluley about the Nic Nicosia exhibit currently up at her gallery and then made our way to the Skarstedt booth where art consultant and president of Collector House Jennifer Klos, pointed out the newly acquired piece from the Dallas Museum of Art. Then, it was off to the Ruinart Lounge, presented by Ruinart and Eiseman Jewels, where a bevy of VIPs, including Betsy and RichardEiseman, toasted with friends and marveled at the art from the Peter Blake Gallery that flanked the walls. Continuing our rounds, we stopped by NorthPark’s “Where art meets fashion” pop-up shop and gabbed with the rockstar NP ladies: Kristen Gibbins, Rachel Roberts, MeredithMarceau, and Taylor Zakarin. Among the art hounds were NASCAR royal Jimmie Johnson, collectors Cindy and Howard Rachofsky, Forty Five Ten’s Brian Bolke, restaurateur Shannon Wynne, curator Justine Ludwig, and power couple Rhonda and Fraser Marcus. For all of the evening’s social glitter and art world punch, non-profit fundraising was an underlying factor with proceeds going to the Dallas Museum of Art, Nasher Sculpture Center, and Dallas Contemporary.